petition: REDUCE DISABLING WIRELESS and EMFs! REDUCE DISABLING WIRELESS and EMFs! recipient: Local, national, global leaders, organizations, media, businesses--anyone is welcome to print and distribute this petition to raise awareness and promote change. If choosing to add your name, please sign thoroughly BY HITTING 2ND CONFIRMATION. Please share your personal experience. We are concerned over the lack of honest, sincere reporting or attacks upon individuals who report on the unprecedented risks presented by wireless and other sources of electromagnetic fields (EMFs), as described generally by Project Censorship. We are disappointed that the National Toxicological Program wireless study is being held up from publication for suspicious "independent review" & government scientists prohibited from sharing science, and further that industry/for-profit scientists and others are instead dominating the media to disavow biological harm from wireless and other electromagnetic exposures. We believe the lack of honest reporting or attack of writers reporting on these risks is a threat not only to our health, but to our democracy. Please speak out and against the dangers of wireless to children's health and our own, against the dependence and overuse of energy. Please establish alliances with businesses and organizations willing to halt the wireless and electronic explosion. Science and free speech, not greed or convenience, must be protected if our society intends to protect our children and our environment. Please share the truth about the security and health threats as well as alternatives to support legislation and laws which place human and environmental health above short-term gain. A safer redesign of of regulations, electrical systems, & technology would improve our health and also reduce disabilities and sensitivities (including multiple chemical) which preclude social and economic engagement. There are alternatives, such as supporting small-scale innovation, sustainable business, and local economies instead of Big Tech. Sensitive individuals need support and publicity to move legislation such as listed as Patreon.com/heal. 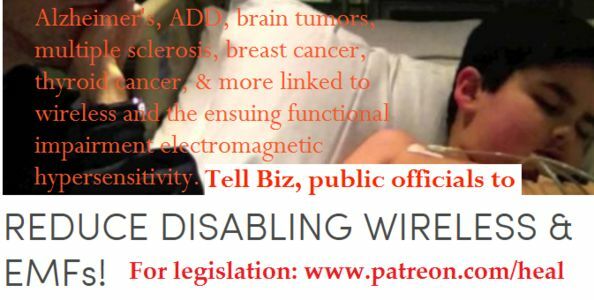 A hidden threat, wireless and other fields from technology cause illness: dementia, epileptic seizures, joint pain, headaches, leukemia, miscarriage, DNA damage, autism, impaired formation of memory, brain alterations, thyroid cancer, diabetes, demyelination, glioblastoma, metabolic breakdown, mast cell and mitrochondrial disturbances, mineral deficiency, electromagnetic sensitivity (EHS), carbohydrate processing errors, nutrient errors, altered drug interactions, morality / behavioral changes, tinnitus (Frey Effect), digital addiction, screen dermatitis, et cetera . . . Studies reveal, too, disturbances in soil organisms, stunning loss of insect diversity, harm to mammals, and disorientation of migrating pollinators and birds. 1000s of studies show harm. Many businesses and consumers are functioning in ignorance of the dangers of wireless signals and their sources, with independent science obscured by the lure of profit and lack of public funding for research. Even so, as of 2014, the independent Bioinitiative Project has categorized and analyzed studies under various categories, such as neurological or gastrointestinal, finding deleterious effects in 60 to 90 percent of the studies in each category, with studies based on just a single source of non-ionizing radiation--such as one telecommunications antenna. History also shows very serious deleterious effects which defy soothsayers. From 1953-1972, miicrowave beams of 2.5 Ghz and 4.0 Ghz were directed to the US Moscow Embassy by the Russians, the same frequencies of routers, microwave relays, radar, satellite links, some mobile phones and automated utility meters. Research revealed malaise and illness at the average power of 1.5 µW/cm2 (Elwood, 2012)--Zbigniew Brzezinski, US National Security Advisor, in 1976 stated this non-ionizing radiation led to the highest rates of cancer in the world. Today, we have multiple, simultaneous sources of non-ionizing radiation. Today, single routers or portable computers emit at 50 µW/cm2 and higher even if under the legal US limit of 1000--a range billions of times over natural levels. Lacking federal or state monitoring, excesses to US guidelines are rampant and rarely punished. Like cumulative sun damage, cumulative non-ionizing radiation adds up and causes cellular damage. Wind turbines, appliances, powerlines, and other equipment can emit harmful non-ionizing radiation, too. Dr. Samuel Milham, an epidemiologist, & others have documented increased disease from increased electrical loads, poor harmonics, microsurges, transformers, inverters, digital pulsing--all skyrocketing today as a result of technology. Regulation for health factors is virtually nil. Federal agencies are looking the other way, thanks to entrenched attitudes about economics, lack of scientific perspective, and administrative financial interests or ties with industry. Overwhelming peer reviewed, scientific literature demonstrates the correlation between electromagnetic frequency (EMF) exposure and neurological, cardiac, and pulmonary disease, as well as reproductive disorders, immune dysfunction, cancer, metabolic disorders, and other health conditions (see scientific evidence). Many more than 10,000 studies show detrimental effects, although mainstream media is confused on this concrete proof (see signature #24). This research is especially concerning regarding the effects on lifetime supplies of female eggs/pregnancy, the ecosystem, and the health, physical and mental, of children. In the Moscow study, 47.7% of women miscarried in the first seven weeks of pregnancy--what then, with greater exposure today? For individuals with electromagnetic hypersensitivity (EHS), entering an electrosmog zone can be painful and/or disabling, in addition to increasing cumulative radiation damage and increasing chances others become ill--in advanced stages, EHS, highly correlated with dementia and neurological diseases, causes symptoms even to electrical fields, refrigerators, motors, lasers, and the gadgets of "normal" life today. EHS symptoms correlate strikingly with multiple sclerosis and mastocytosis and ME/CFS and Gulf War Syndrome (microwaves were utilized heavily for Project Sheriff as well as depleted uranium in Iraq), and increase dependence, isolation, and poverty. Multiple chemical sensitivities and allergies are often a partner to EHS, as EMFs disrupt the protective membranes around the brain, gut, and eyes, allowing free flow of chemicals and viruses. More so than other disabling illnesses, these sensitivities can result in estrangement from society, impoverishment, and ridicule, as these sensitivities "inconvenience" others and require exclusion from the chemicals and EMFs common to society. Necessarily, steps must be taken to protect and house individuals with EHS and MCS safely & provide community & services, as has begun in countries such as Italy, Russia, Canada, France, Sweden, and Switzerland, where EHS is also formally recognized as a medical condition. The military has proposed electromagnetic warfare in national parks--a dangerous idea and terrible precedent. Under the illusion of defensive measures, the military would harm the ecosystem and endanger surrounding life. The pretense of convenience and government as all-knowing needs an end--short-term interests need to be set aside so that money no longer goes towards those proposing that wireles & military aims should be ubiquitous. This proposal is dangerous, and our military should not be harming the Earth and its people as a matter of "protection." Effects of EMFs can be genetic alterations and impact even the life and fertility of soil, upon which we depend for sustenance. Military and economic interests foolishly chose lax standards for the public in light of the temptation of surveillance, weaponry, patents, & cheap price of wireless communications, and now face the embarassment and liability of extreme error. A number of security experts have come before US Congress, warning of security risks from the lax use of wireless in our utility grid and numerous appliances. In her article "The False Smart Meter Narrative And Lessons From St. Louis Radioactive Clouds," Patricia Burke describes how businesses attempt to profit from "smart" meters and alternative energy while damaging our security, privacy, and potentially our liberty. As a society, our children and our health must come first, and precautionary science replace the status quo. Even lacking popular media coverage and support, more of our scientists and doctors must come forward to warn of the risks, as have the American Academy of Environmental Medicine and American Academy of Pediatricians, and in Boston with the Boston Physician's Appeal in 1997, and most recently with the International EMF Scientist Appeal to the United Nations--all despite risks to personal careers and grant funding. Google, Facebook, and Tesla Motors are now planning to launch global WiFi. Google (Boycott), Facebook (Boycott), and Tesla Motors (Boycott) need to halt and need to know the economics will fail, even if beginning in a country far removed from the USA. Comcast Xfinity, too, is broadcasting wireless clouds for public use from residential routers, increasing not only hackability, but radiation intensity & exposure. While global WiFi could be the last straw for the elderly, the weak, and harm many more children, the DNA damage could have long-term handicapping effects on reproduction and our genetic heritage--what kind of world do we want our children to share? Writing a petition is a start, but to truly protect ourselves and our children, convenience needs to be set aside. Our electrical grid needs an overhaul to keep energy clean and local, with good harmonics--this could be quite an expense, but could provide electrical and construction jobs. Creating a safer and less hackable electric grid may take time, resources, and energy. The marketing of dangerous, unsustainable technology to every man, woman, and child needs to halt. The production of much of this technology is costly to the environment, releasing chemical toxins and requiring mining, in addition to the aforemented energy consumption and radiation. To base a society on technology that harms a few or many is wrong. For equity, communities require access to safer computers, but for sustainability, communities must support alternatives to communications, work, and life online and limit dependence. Corded phones should be available for public use and in working places. Meanwhile, work needs to be done to remove the various cumulative sources of wireless radiation, from wireless RFIDs, satellite TV, internet, magnetic strip readers, cordless phones, wireless games, appliances, utility meters, cars, etc. This is necessary to protect the existing and following generations from cumulative damage and increasing sources of EMFs, as well as the risks of dependence upon technology for all our needs. Please sign to show support, and please take the steps to remove wireless devices and reduce exposure to other equipment generating electromagnetic fields. Please also do what you can to publicize the issue and generate support for wireless removal. There is another petition on this site with 6000 plus signatures intended for Congress: http://www.thepetitionsite.com/6/urge-congress-on-emf-safety-fcc-must-change-exposure-guidelines-for-microwave-radiation-exposure/ If you could sign both, that would be great--you could even mention this petition intended for local leaders & businesses in New England. In the other petition, many mention cancers initiating after cell tower installation, or brain cancers spiking in the young. Brain cancer is the fastest-growing cancer in children. I am sharing my new website http://www.patreon.com/heal which is now focused on Massachusetts, but I expect to work at the federal level soon. I hope to continue writing legislation to reduce electromagnetic signals, but require public and likely $ support to justify my work to family so please share my site. If you wish to support my ability to write further legislation, please donate. Or, feel free to check posts & my work--I'll post testimony by 6/23/17 given today to state legislators. Hi, I'm sharing in hopes of making connections and getting more help in Massachusetts. I want to work with others at the local level to get wireless out of schools and towns, and support legislation. To be able to work with others to write petitions would be helpful. I know of a few folks, but we could always use more.